Prof. Victor Andreevich Toponogov, a well-known Russian geometer, was born on the 6th of March, 1930 and grew up in the city of Tomsk, in Russia. During Toponogov’s childhood, his father was subjected to Soviet repression in 1937. After finishing school in 1948 Toponogov entered the department of Mechanics and Mathematics at Tomsk University, and graduated it in 1953 with honours. In spite of an active social position and receiving high marks during his studies, the stamp of ‘‘son of the people's enemy’’ did not leave Toponogov with any hope of continuing his education at the post-graduate course level. However after Joseph Stalin’s death in March of 1953, the situation in the USSR was cardinally changed and Toponogov was included as a post-graduate student at Tomsk University. 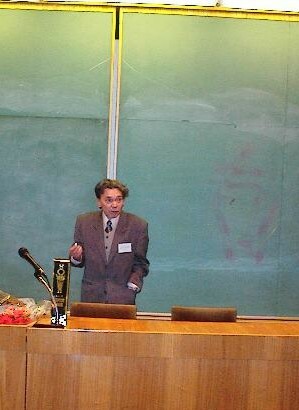 Toponogov's scientific interests were influenced by his scientific advisor, Prof. A.I.Fet (a well-recognized topologist and specialist in variational calculus in the large, a pupil of L.A.Lusternik) and by the works of academician, A.D.Aleksandrov. In 1956, V.A.Toponogov moved to Novosibirsk where in April of 1957, he became a research scientist at the Institute of Radio-Physics and Electronics, then directed by well-known physicist, Y.B.Rumer. In December of 1958, Toponogov defended his Ph.D. thesis at Moscow State University. In his work the Aleksandrov convexity condition was extended to multi-dimensional Riemannian manifolds. Later on, this theorem was called Toponogov (comparison) theorem about the angles (see, for example, Meyer W.T. Toponogov's Theorem and Applications. Lecture Notes, College on Differential Geometry, Trieste. 1989). In April of 1961, Toponogov moved to the Institute of Mathematics and Computer Center of the Siberian Branch of the Russian Academy of Sciences, at its inception. All his subsequent scientific activity is related to the Institute of Mathematics. In 1968 at this institute, he defended of his Doctoral thesis on the theme ‘‘Extremal problems for Riemannian spaces with curvature bounded from above’’. From 1980 to 1982, Toponogov was deputy director of the Institute of Mathematics and from 1982 to 2000, was head of one of the laboratories of this same institute. In 2001, he became Chief Scientist of the Department of Analysis and Geometry. The first 30 years of Toponogov's scientific life were devoted to one of the most important divisions of modern geometry — Riemannian geometry in the large. From the school of mathematics, everybody obtained an impression about so called synthetic methods in geometry, whose sense are the consideration of triangles, conditions of their equality and similarity, etc. From the Archimedean era, analytical methods have come to penetrate geometry — this is expressed most completely in the Theory of Surfaces, created by K.Gauss. Since that time, these methods have played a leading part in Differential Geometry. In the fundamental works of A.D.Aleksandrov, synthetic methods are again used because objects under study are not smooth enough for applications of the classical analysis methods. In the creative work of V.A.Toponogov, both of these two methods, synthetic and analytic, are in harmonic correlation. The classic result in this area is the Toponogov theorem about the angles of a triangle composed from geodesics. This in-depth theorem is the basis of modern investigations of the relations between curvature properties, geodesics behaviour, and the topological structure of Riemannian spaces. In the proof of this theorem, some ideas of A.D.Aleksandrov are combined with the in-depth analytical technique related to the Jacobi differential equation. The methods developed by V.A.Toponogov allowed him to obtain a sequence of fundamental results such as characteristics of multi-dimensional sphere by estimates of the Riemannian curvature and diameter, the solution of the Rauch problem for even dimensional case, and the theorem about the structure of Riemannian space with nonnegative curvature containing a straight line (i.e., the shortest path which may be limitlessly extended in both directions). This and other theorems of V.A.Toponogov are included in monographs and textbooks written by a number of authors. His methods have had a great influence on the modern Riemannian geometry progress. During the last 15 years of his life, V.A.Toponogov devoted himself to Differential geometry of two-dimensional surfaces in the three-dimensional Euclidean space. He obtained the essential progress in the direction related to the Efimov theorem about non-existence of isometric embedding into three-dimensional Euclidean space of a complete Riemannian metric with separated-from-zero negative curvature, and with Milnor hypotheses declaring that an embedding of a complete Riemannian metric with a sum of absolute values of principal curvatures uniformly separated from zero does not exist. After starting his work with Y.B.Rumer, Toponogov focused his attention on relations of mathematics with natural sciences. Many efforts of Toponogov are now devoted to the training of young mathematicians. He was a lecturer in Novosibirsk State University and Novosibirsk State Pedagogical University for more than 45 years. More than 10 of his pupils defended their Ph.D. theses and 7 — Doctoral degrees. V.A.Toponogov passed away on 21 November, 2004 and is survived his wife Ljudmila Pavlovna Goncharova and three sons. One of the main objects studied in modern geometry is so called Riemannian space. Riemannian spaces are defined usually by some sufficiently complicated constructions, using concepts of the analysis. Visually Riemannian space may be characterized in such a way that in a small neighbourhood of its arbitrary point the geometry of a space does not differ from the usual Euclidean geometry, and the difference is less when the taken neighbourhood is smaller. The theory of Riemannian spaces is said to be a "Riemannian geometry". The Lobachevskii geometry is an example of Riemannian geometry. Another example – geometry on a sphere of n-dimensional Euclidean space. These are examples of Riemannian spaces of a constant curvature. The works of V.A.Toponogov are devoted to the study of Riemannian geometry "in the large". One of his main results is well-known in the literature as Toponogov comparison theorem. It is intensively used in modern investigations of Riemannian geometry and is referred in many monographs and textbooks on this subject. V.Y. Rovenski (foliations on Riemannian manifolds and submanifolds). Teaching activity of V.A.Toponogov is related with Novosibirsk State University and Novosibirsk State Pedagogical University. During the years he was a lecturer of modern courses of differential geometry, tensor algebra and tensor analysis on the mathematical and physical faculties. With the editorial assistance of V.Y. Rovenski. ...there are nice exercises; any student working through these exercises will learn a great deal. These exercises are meaty, well- thought-out, and stimulating. Scientific projects of V.A.Toponogov are realized in more than 40 scientific papers and training books. 10. One theorem on Riemannian spaces containing straight lines. – Int. Congress of Math. : Theses. Moscow. 1966. 170–171. 12. One extremal theorem of Riemannian geometry. (in Russian) – 2-nd Russian Simposium on geometry in the large: theses. Petrozavodsk, 1967. P. 67. 38. Tensor algebra and tensor analysis: lecture course notes for the students of Physical Department. (in Russian) – Novosibirsk, Novosibirsk State University. 1995. 50 P.
39. Practical works on Foundations of Geometry: Methodical instructions. (in Russian) – Novosibirsk, Novosibirsk State University, 1995. 24 P. With N.A. Burova. 41. Great sphere foliations and manifolds with curvature bounded above. – Article dg-ga/9609007, 1996. 13 P.
42. Great sphere foliations and manifolds with curvature bounded above. – Appendix A to the book by V. Rovenski “Foliations on Riemannian manifolds and submanifolds.” Boston etc. : Birkhauser. 1998. 218–234. With V. Rovenski. Zbl 0958.53021.